In an effort to support greener energy, Best Buy has agreed to allow electric vehicle charging stations at twelve of its Arizona, California, and Washington stores by March 2011. Announced by ECOtality, a charging infrastructure developer, the Blink charging stations, referred to by Blink CEO Jonathan Read as the “Swiss army knife of telecommunication,” will also have access to local networks, Wi-Fi, Zigbee, and cell phone networks. The announcement helps put into effect ECOtality’s vision of placing Blink stations at large retail stores throughout the country, providing a first point of contact for electric car drivers. Having already installed 6,000 charge stations for vehicles such as forklifts and ground-support vehicles at airports, this new development demonstrates a push to reach consumers directly. With $230 million dollars in investment funds in the company, both from the Department of Energy and private investors, ECOtality is poised for the next step. Analyst John Gartner of Pike Research estimates that the electric vehicle charging industry will generate nearly 300 million dollars by the year 2015 in addition to revenue already accumulated by the automotive industry. Best Buy, which began selling electric scooters and motorcycles last year, plans to have stations installed in Tucson, Phoenix, Los Angeles, San Diego, and Seattle. While the value you vehicle charging stations is not yet known to large retailers, the agreement between Best Buy and ECOtality shows increasing interest by retailers in alternative fuel and vehicles and perhaps the start of a new, greener trend. 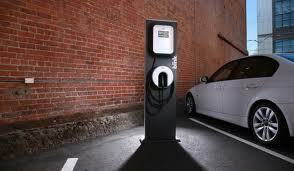 Be the first to comment on "Best Buy Goes Green with Electric Vehicle Charging Stations"